Our saucer chair is a cool style and comfortable addition for your bedroom, dorm room or apartment. Microsuede Saucer Chair is especially designed for college students but not restricted to school only. 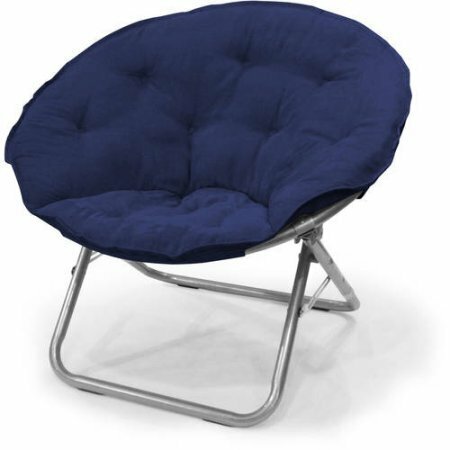 It features a fold-able steel frame and a soft, wide seat for maximum comfort. The cushion in this Mainstays saucer chair is made of 100 percent soft and durable polyester and is soft and relaxing. It folds up and can be stored when not in use. Ideal for gaming, reading, watching TV or lounging. Requires no assembly! If you have any questions about this product by AERii, contact us by completing and submitting the form below. If you are looking for a specif part number, please include it with your message.